In just the past two years, there has been a vast increase in the share of people in many emerging nations surveyed who report owning a smartphone. Despite these rapid changes, richer countries in the survey still report higher levels of smartphone ownership compared with poorer nations. And smartphone rates in advanced economies still have plenty of room to grow. Overall, a global median of 43% say that they own a cellphone that is a smartphone, which is defined as a cellphone that can access the internet and apps, such as an iPhone or an Android. 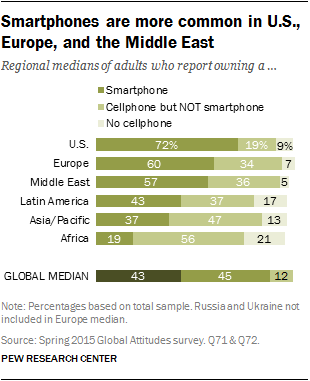 An additional 45% across the 40 countries say they have a cellphone that is not a smartphone. A median of only 12% among respondents say that they do not own a cellphone of any kind. The highest rates of smartphone ownership are among the richer economies surveyed. This includes 88% of South Koreans, 77% of Australians, 74% of Israelis, 72% of Americans and 71% of Spaniards. Beyond the advanced economies surveyed, smartphone ownership is also relatively high in Malaysia (65%), Chile (65%), Turkey (59%) and the world’s largest smartphone market, China (58%). The lowest levels of smartphone ownership are in poorer countries concentrated in sub-Saharan Africa and South Asia. This includes smartphone ownership rates of two-in-ten or less in Senegal (19%), India (17%), Burkina Faso (14%), Tanzania (11%), Pakistan (11%), Uganda (4%) and Ethiopia (4%). However, the low rates of smartphone ownership in these countries are just part of the story. First, while the 2015 survey shows only 17% of Indians owning a smartphone, the population of India is well over 1 billion people, so it is still one of the largest smartphone markets in the world. Second, majorities of people in all of the countries surveyed, with the exception of Ethiopia, own at least a cellphone. And even regular mobile devices can be a lifeline for people in Africa and in other parts of the developing world. 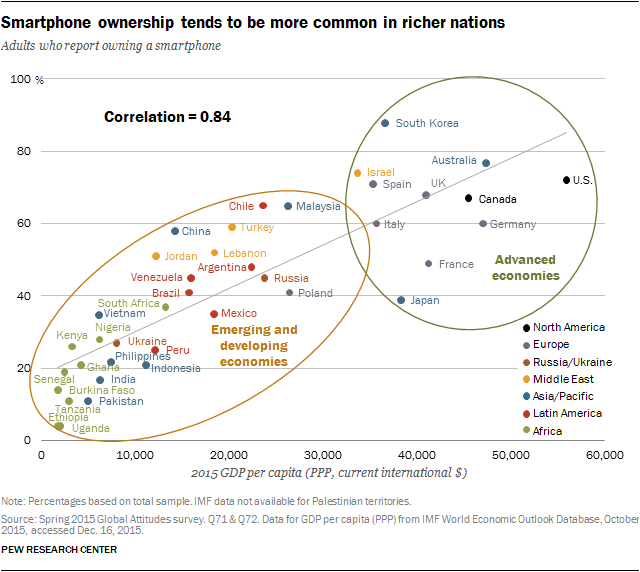 As with internet usage, there is a strong correlation between country wealth and smartphone ownership (0.84). As countries get richer, and smartphones go down in price, it is likely that this relationship between country wealth and smartphone ownership will begin to diminish as it has for overall cellphone ownership. The regional patterns of smartphone ownership tend to mirror those of internet access. People in the U.S., Europe and the Middle East are more likely to own a smart mobile device, compared with those in Latin America, the Asia-Pacific region and Africa. In a few short years, the share of smartphone owners in many emerging nations has skyrocketed. In 2013, when the question was first asked, many countries had smaller smartphone markets, as most cellphone owners used mobile devices that lacked apps or access to the internet. But in 2015, in many of these same countries, such as Turkey, Malaysia, Chile and China, the majority of mobile owners had smartphones. Overall, there have been significant increases in smartphone ownership rates in 18 countries surveyed in both 2013 and 2015. Especially large increases since 2013 have occurred in several populous countries, such as Brazil, Russia and China. The rapid expansion of smartphones to this diverse set of countries is notable, but ownership rates still trail that of many wealthy countries in the survey. As with internet access, Millennials (ages 18-34) are more likely than older generations to own a smartphone in virtually every country surveyed (the lone exception being Ethiopia). And unlike internet rates, the largest generational divides on smartphone ownership are found among European nations. For example, 85% of French Millennials own a smartphone compared with 35% of French people who are 35 or older, a 50 percentage point difference. Similarly large gaps are found in Poland (+50) and Germany (+42). Those with more education are more likely to own a smartphone than those with less education in every country surveyed with a sufficient sample to analyze. The education gap on smartphone ownership ranges from 62 points in Lebanon to 12 points in Israel. The income gap within countries is also consistent across regions and differing levels of economic development. In all of the countries surveyed with sufficient sample sizes, people with a higher income are more likely to own a smartphone than people in the lower income bracket. 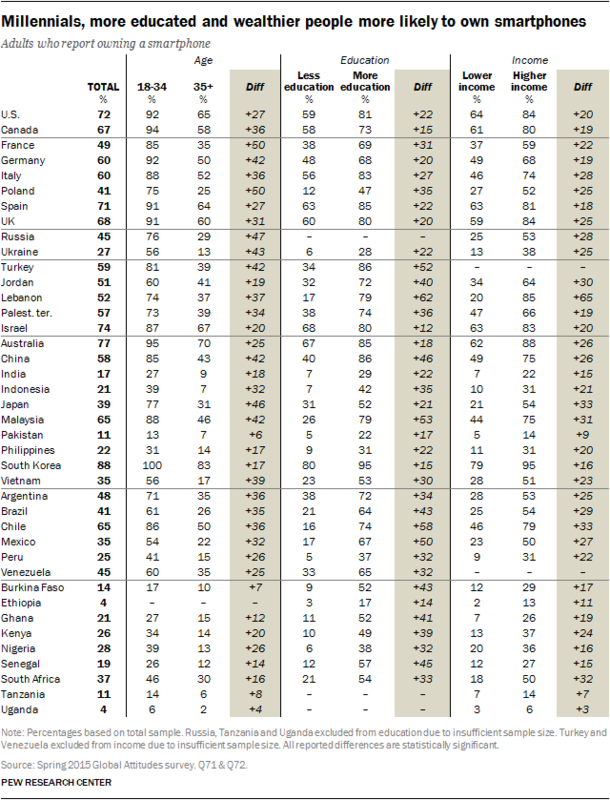 Additionally, there are gender gaps on smartphone ownership in 19 of the countries surveyed. The gender gaps are especially large in Mexico, Nigeria, Kenya and Ghana. It should be noted that gender gaps also appear on basic cellphone ownership in many countries, especially in sub-Saharan Africa.